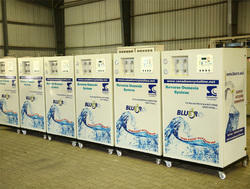 Leading Manufacturer of blue ro industrial water purifier and domestic ro from Chennai. DOES YOUR DOMESTIC WATER PURIFIER Give you total production? Blue Ro's futuristic technology features a never before experience for our customers.” Blue RO comes with patent pending nano carbon with Silex pre-treatment system to eliminate 3X suspended solids, smell, odor, color, harmful gases, chemicals, and pesticides. The system has a longevity, twice as much as normal of conventional systems. For the very first time a technology which brings: Service at your finger tips”. “Why Pay for frequent service “First time in the world an App to service your Blue RO in a Snap”. The Blue RO is a generation advanced in membrane technology providing highest recovery using proprietary reverse osmosis membrane. Thus ensuring guaranteed performance long life highest recovery, and lowest power consumption. The Service App provided in certain models enhance membrane performance and life. The Blue RO membrane pore size of 0.0001 ensures pathologically free water in its output. The UV sterilizer in the Blue RO is one of its kind technology which uses FEP advanced UV penetration medium, for maximum pathological kill rate. On customer request, Blue RO can be provided with an Alkalizer. As per the requirement of our customers, we bring forth a wide array of Domestic RO. Our range of Domestic RO is formulated using the latest technology to meet high performance and reliability. Furthermore, Clients can avail these Domestic RO on most affordable prices.